Rich & decadent chocolate cake, layered with sweet coconut icing & drizzled in chocolate ganache. Ummmm, chocolate! I have always associated chocolate with the holidays. Chocolate chip cookies for Santa, hot chocolate by the fireplace, milk chocolate candies in pretty boxes, and then there is chocolate cake. 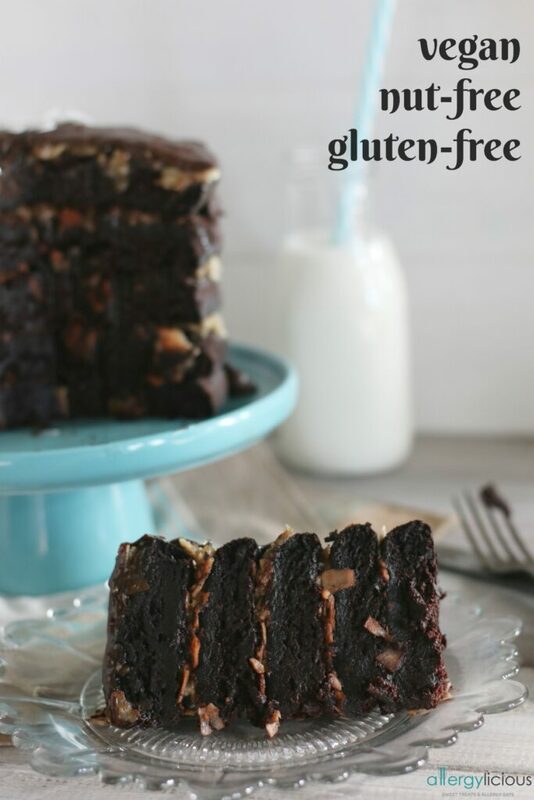 But not just any cake, rich & decadent German Chocolate Cake with that sweet & sticky coconut glaze to be exact. Doesn’t the sound of that bring a smile to your face? And you haven’t even had a bite yet. Well, we’re going to fix that! But first, I want to let you in on a little secret, in case you didn’t know. Chalk this up as “fun facts to know and tell your friends”. Did you know that German chocolate cake isn’t actually from Germany? In fact, it is an American dessert, first made in 1957 by Mrs. George Clay from Dallas, Texas! That’s about as American as it can get, right? The confusion traces back to an American named Samuel German who developed a type of dark baking chocolate for Baker’s Chocolate. 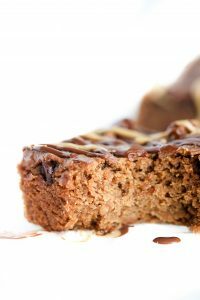 Baker’s then created a German’s Sweet Chocolate in his honor which was used in Ms. Clay’s German’s Chocolate Cake recipe. As this cake recipe grew in popularity, the name changed slightly, removing the plural (‘s) from German’s, thus creating the confusion of who gets credit for this amazing cake. No German’s will get credit for this recipe either! It’s brought to you by yours truly, a Canadian-American. And as a “heads-up”, I’ve sort of strayed away from the traditional recipe which included regular flour, Baker’s chocolate and a caramel-pecan filling made with egg yolks and evaporated milk. Sorry Mrs. George Clay. Instead, I’ve made this Top 8 free, gluten free and vegan friendly! So everyone can have a slice of cake! Holidays can make everyone stress out. There’s a ton more activities, parties, school functions, vacations and get-aways, family visits and then there’s food and what to make everyone. My goal is to make it a little easier for you. 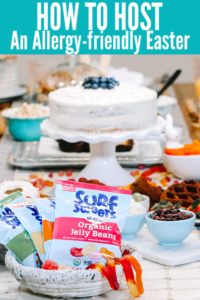 Easier because you can make a dessert that is easily shared with your friends and guests without worry. Easier because you don’t have to figure this all out yourself. Easier because you can just print off the recipe and spend a short amount of time making it then spend the rest of the time, enjoying every delicious “safe” bite. This delicious, German Chocolate Cake has 5 layers of rich chocolate cake with a sweet coconut frosting then drizzled in chocolate ganache for a truly decadent, dessert. Gluten-free, nut-free, vegan. Add 1 TB. of vinegar to a 1 Cup measuring cup then top off with coconut milk. Allow to sit while preparing the rest. In a small bowl, make your flax egg. In a stand mixer, mix together dry ingredients (flour, sugars, cocoa, baking powder, baking soda & salt). In a medium bowl, whisk together coffee, coconut oil, vanilla and milk/vinegar blend until coconut oil has melted. Slowly, pour liquids into flour and blend, making sure to scrape down the sides. Add flax egg and mix well. Bake 25-30 minutes if using 2-8″ rounds. Toothpick will come out clean when inserted in the middle of the cake. Cool 10 minutes then flip onto cooling rack. Allow to cool completely before icing. In a small saucepan, melt butter substitute then add in remaining ingredients. Stir and bring to a slow boil. Allow icing to thicken (5 minutes) then remove from stovetop. Cool before using. In a small saucepan (or microwave safe bowl), add chocolate chips, butter & coconut milk. Melt together and mix well. Lay 1 cooled cake round onto serving tray then cover with coconut icing. Add second layer of cake on top and then cover with coconut icing as well. If using chocolate ganache, pour melted ganache over the top of the cake and allow melted chocolate to run down the sides. Add extra coconut if desired. If using regular flour, simply substitute in place of 1-to-1 mix without making other changes. ** if using regular gluten-free flour, see if Xanthan gum is required. *** I used 5 small cake rounds. If you use this method, bake 15-18 minutes. What are you most looking forward to this holiday season? Maybe it’s a special dessert that your mother makes once a year. Maybe you love having everyone over in your home to celebrate all the wonderful things this year brought your way. Maybe it’s that you get a little time to rest and relax. Whatever it is, I’d love to hear what makes the holidays special for you and I hope that your Christmas and holiday season is as sweet as my German Chocolate Cake :). I hope you are enjoying my new site! Remember that I always love hearing from you and seeing your awesome remakes! Find me on Instagram @xanderfriendlyfoods (for now ) and tag #allergylicious. 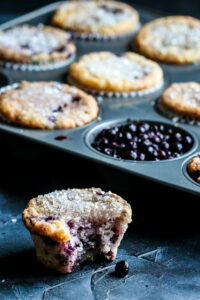 You can also find me on Pinterest sharing the newest, delicious, allergy-friendly foods! 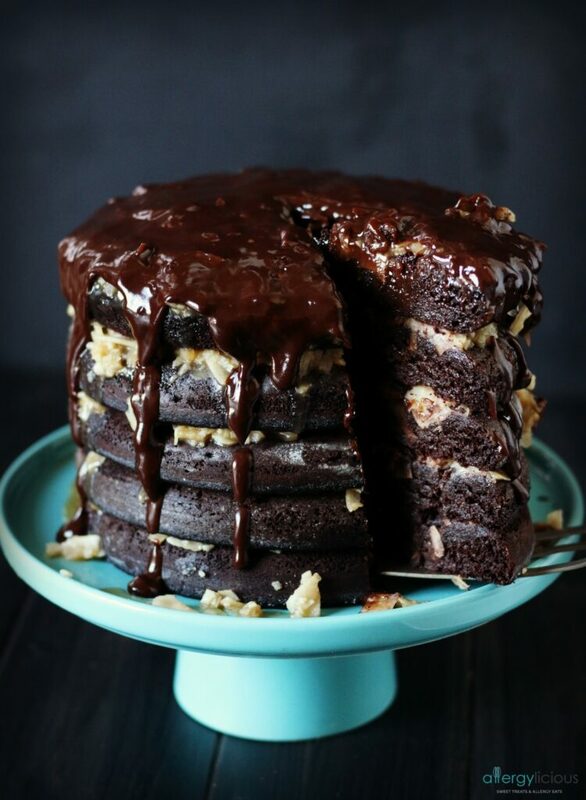 German chocolate cake has always been a favorite of mine, and I’m totally drooling over your photos. This cake looks amazing! Thanks so much Dianne. Its a favorite of my boys as well. This looks incredible and I love the new site! That looks so fudgy! My husband loves german chocolate…makes me wish I liked coconut! PS–love your new site! This is gorgeous! Love all of that ganache cascading down the cake! YUM! Can’t beat chocolate on chocolate, right Emily? Oh my goodness! That chocolate ganache really puts it over the top for me! Absolutely stunning! This looks delicious! I have one question about the coconut milk. Is it the canned or quart sized ones available in the fridge and on the shelf? Thanks! Honestly, you could use either but when I first made this recipe, coconut milk in the fridge was harder to come by, so I used the the light coconut milk that is shelf stable. Either will work though.